Congratulations Bengt Lindström 80 years! Gallery GKM proudly presents a unique selection of paintings by Bengt Lindström from a private Belgian collection. These paintings reflect Bengt Lindströms powerful and dynamic creative spirit from the important period of 1968 to 1997. The exhibition is on from June 28th to August 28th 2005. 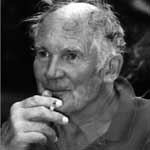 Bengt Lindström is a big man from the central parts of the Norrland province and was born in Storsjö Kapell on 3 September 1925. He has been residing in Paris since 1948, but during the summer months, he stays on the coast of Norrland. From the age of fifteen, he has continuously, but with indefatigable strength, devoted himself to painting in a personal manner, mostly large, colourful paintings. After his graduation at academic upper secondary school, he studied at various art schools in Stockholm, Copenhagen, Chicago, and Paris. He has studied under art-world celebrities like Isaac Grünewald in Stockholm, and André Lhote and Fernand Léger in Paris. 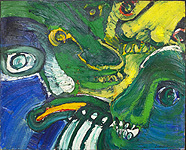 When Bengt Lindström moved to Paris, his art was to be influenced and affected by the COBRA group. 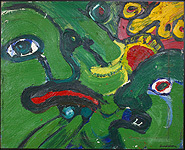 COBRA was founded in 1948 by artists like Asger Jorn, Corneille and Karel Appel. The group worked with colour as a means of expression of its own, quite regardless of previous conventions, but with feeling and intuition as important ingredients. 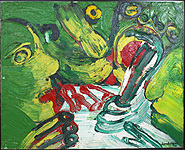 This was also to become Bengt Lindströms way of expressing himself in his painting. His motives come exclusively from the realms of man and of animals. Howling, growling, screaming and laughing beings cover the surface. 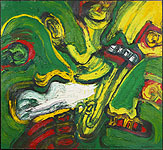 His painting is driven by a primitive force, a furious energy, which seems to originate from the dawn of time. He has also found inspiration in Nordic mythology, the Viking Age, and in folk art from various countries and epochs. As an exiled Norrlander, Bengt Lindström strictly adheres to certain Norrland qualities. The titles he gives to his paintings often point to Norrland and Nordic sources of inspiration. Bengt Lindström has become successful in the art world and has held exhibitions at many well-known and well-reputed art galleries and museums around the world. As Le Grand Viking du Nord, and in company with artist like Öyvind Fahlström, Max Walter Svanberg, Bengt Olsson, and Erik Dietman, he has become one of Swedens internationally most renowned painters.